SYNOPSIS - Bled dry by interminable warfare, infighting and bloody confrontations with Lord Anomander Rake, the Malazan Empire simmers with discontent. Its legions yearn for some respite. For Sergeant Whiskeyjack and his Bridgeburners, and Tattersail, surviving sorceress of the Second Legion, the aftermath of the seige of Pale should have been a time to mourn the dead. But Empress Larseen's gaze has fallen upon Darujhistan. For this ancient citadel, last of the Free Cities of Genabackis, still holds out against her. Sorry's left hand darted out. A dagger flashed between them. The blade entered the man's right eye and then his brain.He jerked back over the rail and fell, landing with a heavy thud beside the steps. Sorry walked up to him and retrieved the dagger. FL Speak - Astounding debut. And might i add, an impossible piece of work. This has to be one of the most complicated beginnings to a fantasy series. The book starts with war and ends with war, with more war in between. 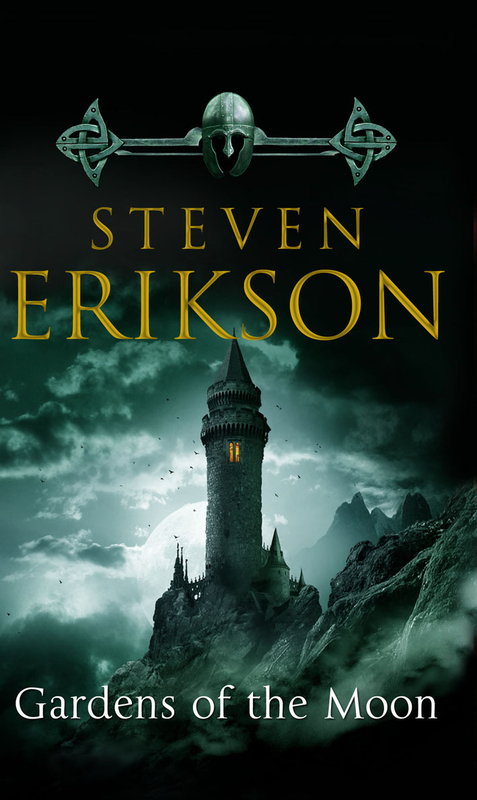 It starts with a young noble boy wishing to join the vast army of the Malazan under the Emperor when he meets one of the generals and the Empress in a dusty road. Few years later, the Empress kills the Emperor and everyone else who was once loyal to him. Its the story of the Bridgeburners, the most feared squadron of the 2nd Legion under the command of Sergeant Whiskeyjack and their struggle to stay alive since the Empress is determined to disband those who belonged to the Emperor. Its the story of Tattersail, a sorceress, who was betrayed by her High Mage during the fall of Pale and upon whom came the responsibility of keeping the Bridgeburners alive. Its the story of that young boy who grew up to be a captain and sent to lead the diminshed Bridgeburners to search for a killer in disguise while the Empress uses him as a pawn for higher purposes. Its the tale of the City of Darujhistan, where the Guild of Assassins and the sorcerers search for a way to save the last free city. This is the story of a young thief who unknowingly becomes a pawn for the Gods when Chance decides to favour him as the coming war threatens to spill even immortal blood. This is the tale of Lord Aromander Rake and his fragile allies who fight against the Malazan Empire. As the writer said in the preface, you will either love the book or completely hate it. As for me, it was the former. This is one of the best adult fantasy books i have read. Full of magic and full of violence, with plots within plots within plots. All the characters assemble in Darujhistan and this is where the plot thickens. No allies are allies, everyone has their own agenda. The Moon Spawn ally with the High Alchemist of Darujhistan to thwart the Empress' progress while the Bridgeburners try to pull themselves out of certain death by changing all the rules. Plans go haywire when the Gods themselves decides to join in. This is a must read book for serious fantasy lovers. You might hate it. But its worth a try. This is one gem of a series that is sure to keep giving me goosebumps. My Rating - 4.4 out of 5.